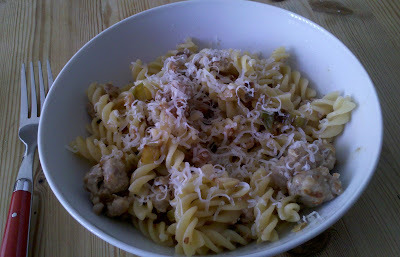 I was browsing the internet looking for new family meals when I came across this Jamie Oliver recipe for a sausage pasta dish, called Proper Bloke's Sausage Fusilli. Sausages are an essential standby in our house, as for hundreds if not thousands of families. In this recipe, you squeeze the sausagemeat from the skins and fry in a little olive oil, dousing with wine and a few herbs and spices and tipping in some cooked pasta. The first time I made this, I followed Jamie's recipe to the letter and the children refused to eat it. I couldn't see why - it was really tasty, and they love sausages and pasta and often eat food with wine cooked in it. Looking back, I think it was probably the herbs and spices (oregano, parsley, lemon, black pepper, chilli) and the strong taste of the Italian-style sausages I used. So I toned it down and cooked it another night and everyone loved it. Here's my version, although I must repeat that the method of cooking the sausages and crisping them up before adding the pasta and other ingredients is all Jamie's work and not mine. If you love strong flavours then do check out his recipe. The secret, as Jamie states, is to get the sausages really golden before adding any of the liquid, and do get the best quality sausages you can get, preferably the kind with coarse meat. Cheap sausages will just turn to a pale mush and won't colour the same. Put on your pasta to boil in some slightly salted water. De-skin the sausages and fry the sausage meat in about a tablespoon of olive oil, breaking it up with the spoon you're stirring it with. Turn the heat up, you want a golden colour and the sausagemeat should look similar to mince. Once the sausagemeat has crispened up, pour in the white wine, letting it sizzle and bubble. Keep cooking the sausage and wine until the wine has reduced by approximately half. Make sure to scrape the bottom of the pan with a wooden spoon or spatula to release any cooking juices that have stuck to the bottom - this will combine with the wine to make a light sauce. Toss in the butter, and then the drained, just-cooked pasta. Slosh in a couple of tablespoons of the cooking water to thin the sauce and help it stick to the pasta. Scatter over a handful of grated Parmesan and then stir to mix. Serve with more Parmesan to grate over at the table. Hi Jenny! Great news, hope you like it. Just get the sausage meat really caramelised before you add the wine and your sauce will have loads of flavour! This is a great favorite in our house, my thirteen year old son likes it so much that he learnt how to cook it himself. Hi Andy, fantastic! And it gives so much flavour for such a simple-to-make dish :) Thanks for your comment.